If you've got more than a few animals then having some die is an enviable part of keeping them. I know I've posted before about involving the children in every aspect of what I do here and yesterday was no exception. The day before we'd had a triple born, the one wasn't going to be a very good lamb, it couldn't stand and faded pretty fast. I could have messed about with it and tried bottle feeding, but you get a feel for when these things will work or not. By the morning it was dead. When I picked my eldest up from school I mentioned this and both girls asked questions about what had happened. Then later when they came to help me feed the ewes they asked to see the dead lamb. I got it out from where I'd put it and laid it on the ground. They both studied it very hard for a few minutes before going off and playing in the trailer. When we came back in they both told their mum, very matter of fact, that the lamb had died because the mother sheep had had three lambs and didn't have enough milk to feed all three. I was really pleased with how they dealt with the subject and how they reacted around the dead body of the lamb. I think children really pick up on the reactions of the people around them, around the animals I'm generally very calm, quiet and move softly (unless I'm trying to catch them) and the girls are the same, they make me really proud around the animals. They also know they're not people, far too many people anthropomorphise animals, the children can see that they don't have human emotions. A sheep loosing a lamb will forget about it very quickly, sometimes in a few hours, a sheep in a lot of pain lambing will evoke no emotion from a sheep sat next to it. They also know why we keep them and I tell them when we eat one that we've bred here, they seem to like to know where their food has come from even at their young age! Brave parenting, too many people see animals as soft furry things, which is an unrealistic view. I agree children pick up feelings and views from their parents. Thanks! Not sure it was brave, just seemed the right way to go about it. I think you've taught them well. I think this is the only thing you can do when you live the lifestyle you do. I think it is important for children to understand where life begins and sometimes has to end when you are rearing your own animals. Yes, children are so easily influenced by the attitudes and opinions of parents. thanks Louise, I think the way we react to things is so important, although they all take things in differently as well. I am amlways shocked when people find what we do, and what you're doing, wrong. I shake my head in wonder when people say what we do (eat our own well raised meat) is cruel. Then they tell me they buy Tesco chicken on a "deal"....what you're doing is exactly what we are and I'm in 100% agreement. It's not always easy but good on you. Lol, pleased you said you're not calm etc when catching them! The air is blue when we have an escapee! Certainly not calm when catching them. Sometimes I could should the bloody things! Thanks Andi, I hate plucking things as well, takes me forever! Just don't tell my kids about getting paid to help though! Amen! If children were raised this way we would have a better world. I love animals, have a farm treat them all well but when it comes down to it they are animals and I am human and God said" Eat them"! Knowing where our food comes from is important. Our granddaughter was here when we took our steer to butcher and she said "where are you taking my friend"? She had a tear in her eye and we explained he was going to the butcher to be made into hamburgers. She loves hamburgers and she smiled and said oh okay! We still laugh at that story and she is 18 now. Love that story! It used to be a speacl thing to pick out the lambs that we were going to have for our own freezer when I was younger, we'd get blamed for months if it turned out to be tough! I grew up on a farm here in Canada, saw what your girls saw, it did not scar me for life, it made me appreciate life. I think that's it, appreciate where things come from and the effort that goes into them. That was a really good thing to do. I heard a girl where I used to work, talking about dinner and one of the other ladies I worked with is a farmers wife asked what are you having? She said chicken, I will get it on the way home from work. The Farmers wife said, come to my house, I have chicken, we processed a load yesterday. The kids helped with the plucking machine. The girl turned and said "Oh no I couldnt eat one of the cute ones with all the feathers, I only eat the bald ones they grow for the supermarket". what? Yeah, I've had friends like that who wouldn't eat anything that grew up here, although I have to admit that less and less people seemed bothered byu it, but that might just be the circles I move in now! Did the same here - it is the only way to handle things I think - be honest, say things in an age appropriate way and tell them what they are asking about. Age appropriate is important as well, mine seem to ask until they understand I guess. 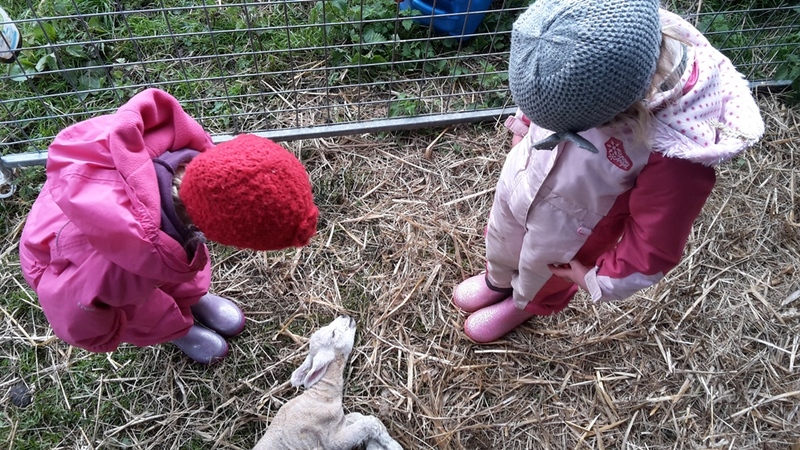 Sorry that the lamb died but what a great way to handle its death with your children. unfortunately with 30 sheep you're going to get some dead ones but on the whole it's been good this year. The children really take it in their stride. We raised four children on our big farm and they all were exposed to death as part of the routine. Now grown they continue to deal with the disappointments of life much better than peers of the same age. I can't prove this is due to their farm raising, but I'd like to think so. Good on you for doing the same with your girls. I think being raised on a farm (or a small farm like this one) gives a very different outlook on life. That said my wife is from a town background and we very much share the same values in life. If they want to learn to dispatch animals I'll certainly teach them but it'll be a while yet. I also show them anything I shoot so they can see the animals.